Business Meeting | How to react when rates dip into negative territory? 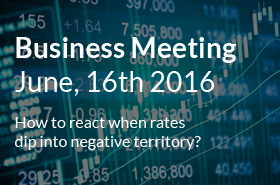 06.16.2016 | Business Meeting How to react when rates dip into negative territory? How to react when rates dip into negative territory? Here is the issue that will be central to our Business Meeting on Thursday 16 June, within our premises. Finance Active will present you financial markets updates, an overview of the current rate products and market opportunities to seize. Cover in a context of negative rates? + Summer cocktail: the opportunity to share a glass of wine on our rooftop!